On Jan. 16, 6 p.m., Wimberley City Council considers HEB's request to build a new store in Wimberley. Because of the huge public interest, City Council has wisely moved this meeting to the Community Center so the people of the Wimberley area can have their say. CARD believes this is an issue of great importance to the future of Wimberley and encourages you to attend and let your voice be heard. DO NOT assume you won't make a difference. City Council is currently divided and could go either way on this issue. On Monday, Jan. 6, representatives of HEB met with representatives of CARD to discuss CARD's numerous concerns. The meeting was held at HEB's request after hearing many comments from CARD and other citizens. It was a very frank, detailed, surprising and - as you might guess - lively three-hour discussion. CARD had a long laundry list of concerns and "wants." HEB knew our list and treated each item seriously; their delegation of nine experts included civil engineers, an architectural designer, a traffic consultant and a landscape architect. They presented several positive changes to their previous proposals to Wimberley; these included changes requested by CARD and many other citizens. In some cases they went beyond what has been asked of them. In others they were straightforward in saying they could not do them, and why. In addition, since our meeting, HEB has committed to additional changes, which they were unable to make during the meeting. These are not promises, they are commitments HEB is making in their Wimberley proposal, which will go to City Council before the Jan. 16 meeting. According to HEB Director of Real Estate Ben Scott, HEB has been seeking an appropriate Wimberley location for about five years. Until now there has been no location available to meet HEB's desire for a central location, which they require. In November, 2013 HEB and the Wimberley ISD went public with a proposal for HEB to purchase the Bowen School site between RR 12 and RR 2325. This about 8-acre site is between The Wimberley Library and Chapel of the Hills church on the north, and Emergency Lane and Ace Hardware on the south. It was scheduled to be the site of WISD's new ball field complex. At the request of WISD, the proposal was fast-tracked so WISD could secure funds from the sale of the Bowen property to secure a new site for the ball fields near Jacobs Well Elementary School. However, in response to intense public interest, the City of Wimberley appropriately slowed down the review and approval process to allow for public input. After two public comment Planning and Zoning meetings - between which HEB made several requested changes to their proposal - the plan passed P&Z by a 4-3 vote. Recognizing that continued City Council and public concern might mean their proposal could fail, HEB asked for and got Council to postpone its vote until the Jan. 16 date. CARD applauds all these delays for more public awareness and consideration. The HEB store would be placed toward the north side of the property with parking, landscaping, stormwater detention and a gas station/car wash placed to the south. 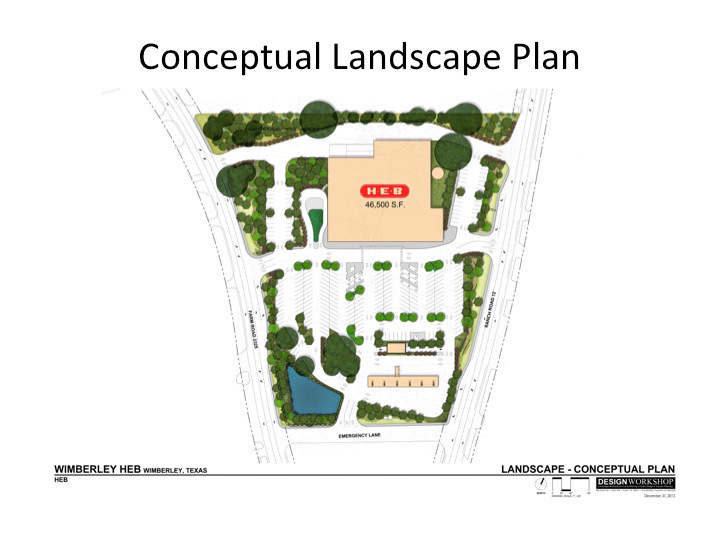 A copy of the proposed HEB site plan and building rendering is available at the CARD website at hayscard.org or at the Wimberley Village Library. LOCATION - This has been a major topic of discussion regarding HEB's move to Wimberley. HEB has judged the currently proposed site as the best for its business model. Getting this particular site was the key to their decision to finally make the move. They have presented this as the only site appropriate. The "Junction" at FM 32/RR 12 would be too far from the population center. Winters Mill Parkway ("the bypass") would be separated from the business center of Wimberley and lacks water or sewer services. In addition, a site outside Wimberley would not give Wimberley any ordinance control, and thus no say in the look or style of the building. Also, a site outside the city would cost Wimberley substantial sales tax revenues. After much consideration and discussion, CARD agrees that, if HEB comes to Wimberley, the current site proposed, while not ideal, best suits Wimberley's future since it strengthens the business core of the city, does not contribute to urban sprawl, has utility services available and will, in the future, contribute sales tax and will add to Wimberley's tax base when a property tax is adopted by the City Council. BUILDING ARCHITECTURE - HEB's early building renderings were unclear and bland, but have evolved several times. HEB brought a new architectural rendering to our Jan. 6 meeting. It was a marked improvement over early drawings, pleasing and consistent with Hill Country and Wimberley style. The design is lower mass and incorporates a metal roof, masonry exterior, and acceptable exterior signage. Large windows have been added to the upper level, creating a much more light and airy look that should make the interior very light. 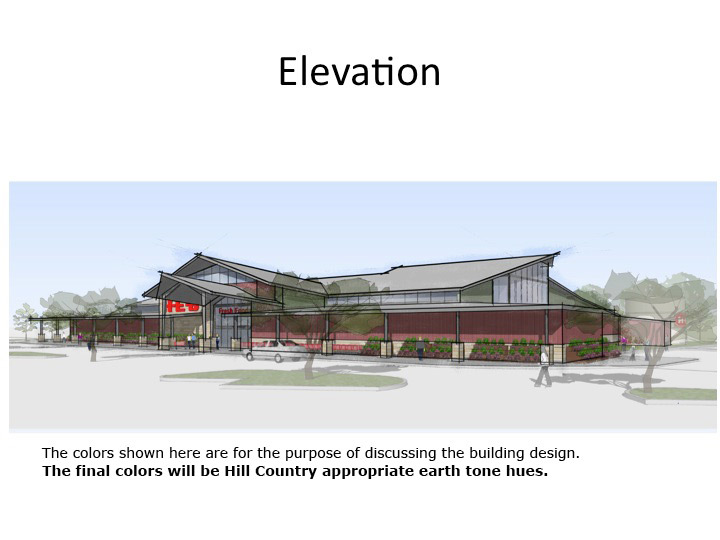 As previously agreed, the store will put aside HEB's corporate color palate and use Hill Country appropriate earth tone hues (not in the rendering on the website). There is a Hill Country style-front porch look. SIGNS: CARD campaigned against large signs. On-building HEB signage was already less than city ordinance levels at the last P&Z meeting, and HEB committed to additional reductions at the CARD meeting. Since our meeting, HEB has further agreed to remove the HEB corporate sign on the west side of the building, an important concession to toning down the look. This means the only large red HEB logo signs are on the building front, and a painted HEB on the east side water tower. In addition, site leveling on the north end of the property will considerably lower the roofline of the store; HEB says the front sign should be obscured to southern view by the new Ace Hardware store. Off-building signs are on the ground (not poles) and in compliance with the Wimberley sign code. LEED: The Wimberley HEB will seek LEED (Leadership in Environmental and Energy Design) certification requirements of the U.S. Green Building Council. LEED standards have become common, but seeking full certification implies an additional commitment; this will be only the sixth store in the HEB chain with that certification. Overall, HEB has made significant strides in this category to please Wimberley requests. SIZE - HEB proposes to build a 46,500 square foot grocery store on the site. CARD considers this too large for this location, and asked for no more than 38,000 square feet. We were not surprised that HEB insisted more space was necessary to be successful here. For comparison, the Dripping Springs HEB is 68,520 square feet, almost 50% larger. Brookshire Brothers is about 37,000 square feet. CARD believes that the improved HEB design (see 2, above) will help offset the size impact of the store, but we would still like to see it reduced..
RAINWATER COLLECTION - HEB has had limited experience with rainwater collection at its various stores and did not propose to incorporate it at this site. This is a key interest to Wimberley, and CARD has pushed HEB hard on it. Because of the need to reduce the use of groundwater within the Hill Country, CARD believes that rainwater collection and use is vital to the sustainability of the aquifer - our drinking water supply. Accordingly CARD has requested that HEB install a large rainwater tank (200,000+ gallons) to collect rainwater off the store roof and that they also collect condensate from the air conditioning and refrigeration units within the store. This collected rainwater/condensate would provide water for site landscape irrigation and also for the proposed car wash. HEB's team has said all along they would like to do it, but did not think they could. However, since our meeting, HEB has committed to onsite rainwater collection for its irrigation. CARD considers this is a key commitment by HEB, showing corporate respect for Hill Country concerns about water. If HEB builds in Wimberley, this is something Wimberley can point to as an example of what we want to see from companies wanting to build here. GAS STATION/CAR WASH - There are already several gas stations in the area, and CARD has stated we would prefer not to see another. The HEB team said that gasoline sales are a major component of the revenue stream for any HEB project and must be included if this project is to be approved by HEB Corporate. (CARD - like many of you - has noted that in areas where HEB sells gasoline, prices have dropped significantly.) Currently, the car wash is not in phase one of HEB's building plans; it is in phase two if it seems practical at that time. CARD believes that if a car wash is developed on site it should be served first by rainwater collected onsite before any use of groundwater. HEB insists they have an interest in this, but also insists they cannot commit to something they are not sure they can make happen. "If it can go farther as we study it, we may go there," said HEB's Scott. "I don't want to say it will happen." DRAINAGE - The site plan for HEB incorporates a water quality/detention pond that exceeds ordinance requirements and will facilitate 100-year storm runoff from the site. This will reduce the burden on the local storm drain system that the city says is undersized. This will be better drainage than the site has currently. LIGHT POLLUTION - As a policy, HEB uses area lighting that complies with the Night Skies recommendations of the Hill Country Alliance. The light spillover from the area lighting is minimized by directing floodlights down and using LED bulbs which also save energy. HEB agrees to turn off most lighting when the store closes. (This is not a 24-hour HEB.) It's worth noting that if HEB does not build here, the site is expected to revert to the originally planned sports ball fields, and the lighting that entails. LANDSCAPING/TREES - The landscape design proposed for the HEB site incorporates drought tolerant plants and trees that will reduce the need for watering. However, at the suggestion of the city, tree planting was proposed at 25% over standard city code requirements, and HEB has committed to that. Many of the site's large trees will be retained, and many other native trees will be planted. HEB's Wimberley proposal has full details on this plan, which was presented at the P&Z public meeting. OTHER - Several questions that are important to CARD and Wimberley residents, such as how a very large store would affect Wimberley's character, its other businesses and employment levels, were outside the scope of this meeting. However, they are important factors for Wimberley residents to consider. CARD RECOMMENDATION - CARD believes the informed people of Wimberley should decide whether HEB comes to our town. One thing has become abundantly clear since we have gone further into the plusses and minuses of HEB coming to Wimberley: no solution will satisfy everyone, or be perfect. Despite the fervent wishes of many, Wimberley is not in a time capsule. Change is going to happen. But we can have a say over what that change is, and how it is implemented. If big stores are coming to the Wimberley area soon, it is up to us to decide now if HEB is the right store to set a good precedent. After attending P&Z meetings, talking to numerous members of city government and direct discussions with HEB, CARD believes HEB has shown a willingness to meet or even exceed many of the requests made by Wimberley people and government. CARD has not gotten everything we have wanted and requested. We do intend to keep pushing for what best serves Wimberley. But we have found HEB to have an exceptional corporate openness, and a surprising willingness to find a way to say yes. And, when the answer is going to be no, we appreciate being told no directly, instead of "maybe." CARD encourages area citizens to attend the January 16th public meeting and express their ideas and concerns on the HEB project to both HEB, and to the members of the Wimberley City Council who will decide the fate of this project that night. They want to hear from you.